Seen from above the sun's north pole on April 8, Mars, Earth and the Sun will lie in a straight line, called "opposition." Mars will be exactly opposite the sun in the sky in a rare cosmic alignment set to take place Tuesday (April 8). Called an opposition, this happens with Mars from Earth's perspective every 778 days, or 2 years, 1 month and 18 days. Think of Earth and Mars as two cars racing on circular tracks. Because Earth is closer to the sun, it travels faster, completing a circuit in 365 days. Mars is farther from the sun and takes longer, 687 days. By the time Mars has completed one circuit, Earth has a lot of catching up to do to get to a point between the Red Planet and the sun. On the day of opposition, Mars, Earth and the sun fall on a straight line. Six days later, both planets will have moved a little along their orbits, but, because of the eccentricity of its orbit, Mars will be slightly closer to Earth than it was before. If you look at the complete orbits of the four inner planets, you can see how Venus and Earth follow almost perfect circles centered on the sun. The orbits of Mercury and Mars are slightly askew. This is where we get the idea of "favorable" and "unfavorable" oppositions of Mars. When Earth passes Mars when Mars is close to perihelion, as it did in August 2003, we have a favorable opposition. When Earth passes Mars when it is close to aphelion, as it did in March 2012, we have a very unfavorable opposition. The opposition next week is slightly more favorable than two years ago, and oppositions will gradually get better until July 2018, when Mars will be close to perihelion and we get a very favorable opposition. 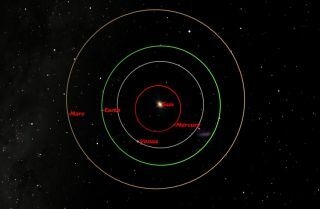 Six days later on April 14, 2014, Mars will actually be slightly closer to the Earth because of Mars' elliptical orbit. But how much difference does this make? In March 2012, Mars was 62.7 million miles (100.9 million kilometers) from Earth. On April 14, it will be 57.4 million miles (92.4 million km) away. But back in August 2003, it was only 34.6 million miles (55.8 million km) from Earth. Editor's note: If you take an amazing skywatching photo of Mars or any other night-sky view, and you'd like to share it for a possible story or image gallery, please contact managing editor Tariq Malik at spacephotos@space.com.